What can you tell us about the engine in that car? It's the 5.7L Hemi with 370 base HP. As far as I know, there are no other upgrades to the engine. They can definitely get up and go. The cars themselves aren't too bad, not really suited for county operations, but when its what they give you, you just have to make due! 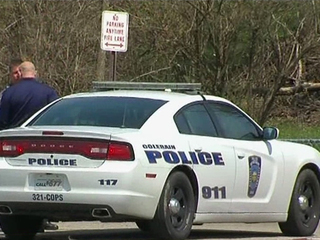 Here, we see a few Mopars, but the Crown Vic has been the standard for local and state for years. Nowadays, the Taurus-based Interceptor is becoming popular. Years ago this agency used the Crown Vic and we still have a couple in use. They seem to like the Charger and will probably stick with it for awhile; they are starting to bring in the newer (2015) Chargers for the administration/detectives. Some of the local agencies within the county use Impalas, Crown Vics, and some have the new Ford Explorers. I'd love to have something that would handle dirt/gravel roads better than a low Charger. Just have to be creative in the way we drive I guess. Our local Sheriffs are getting the Ford Explorer. I have seen more and more of them as of lately. Also i have been seeing Kawasaki police bikes used by the CHP again. For a long time they where on BMW's. The Kawis look cool. I don't like the new light bars..you can't see them unless they are on.One cop car in my hood..
Obviously why they're being used. I run just about the speed limit all the time,always use my turn signal,stay in the proper lane. Some people don't know what a turn lane or suicide lane are or only go half way in them...get so frustrated with them.Don't cross the double yellow on the slightest curve...don't get me started. What really gets my goat is people that have no idea what a merge lane is or how to use it. My local Lowes has one but almost everyone simply pulls up in it and stop to wait on traffic. If I'm on my Bike behind one of those people I'll simply pass them and use the lane as it was designed to be used. Now we are talking,big whip ant,bias ply tires.Barney on his motorcycle with the side car.Could not find the full episode so this will have to do. 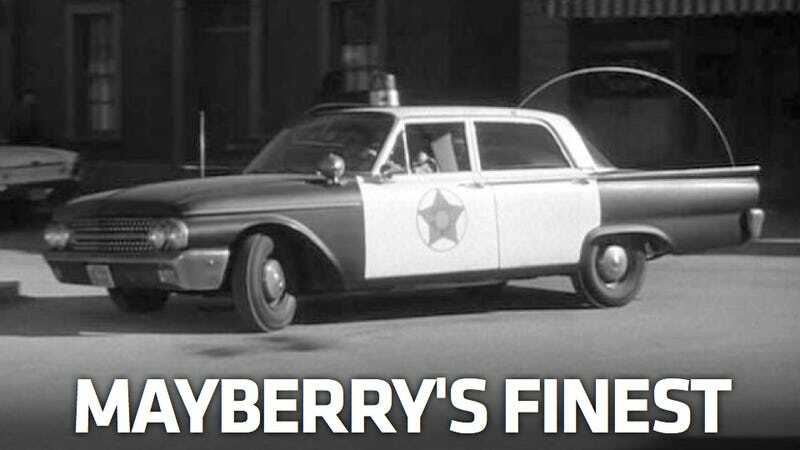 A local Police Officer has an exact replica of that Police Car including the Mayberry Police Logo. He drives it in every parade in the area. He even got permission to use the Red Light with reflector on top and use the Headlights and Brake Lights that Wig-Wag as well. He also wears a replica Mayberry Police uniform. Sometimes the Police Chief of the City the parade is being held in will ride with him. Entering the interstate 15 mph below the flow of traffic and then go to the left lane and run 15 over. If you have a ROKU Internet Streaming Box you can go to the Private Channels list and load the XTV channel in your menu. They just put a channel on XTV that has every Mayberry episode made. XTV is a free channel that operates from donations. Donations are not required to watch. It has hundreds of similar classic and modern TV shows available to watch. You don't even need to register to watch. Once it's loaded in your menu simply click to bring up the XTV channel menu and watch whatever you like. I like XTV better than Netflex. This merge lane is not on the Interstate. It's a high traffic count local road. That merge lane was required by the city to help prevent traffic congestion. I didn't take this one; only because I'm in it! Shinedown along with As Lions, Sixx AM, and Five Finger Death Punch played a show the other night. 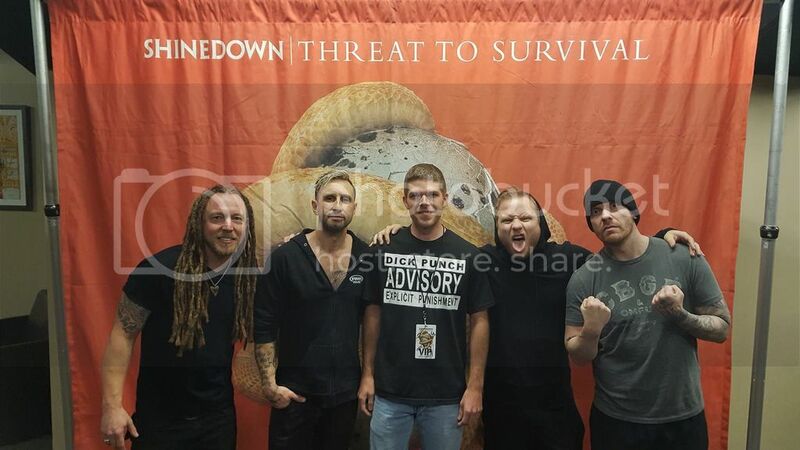 I was fortunate enough to meet the Shinedown guys (again). Any way,one of me a selfie with a 35mm slr is hard to do,big things. On an Amtrak going from LA to Portland a few years back.Oh,notice my XS11 tee I had on that day. Don't know what part of my brain had you painted with a giant beard. Now the XS11 shirt was totally expected! A selfie with that camera is quiet a task!